Located in Monmouth County, New Jersey, the borough of Belmar is a charming small-town community. It has natural beauty and is located near the beach and the boardwalk. The beach is open all year long so visitors can enjoy swimming, surfing, kayaking and fishing off the safe white-sand beaches. The view of the Atlantic Ocean is one of the most panoramic from the one-mile stretch of boardwalk. Belmar is one of the most popular beaches to visit in Central New Jersey. It is extremely walkable, too, so when you decide to visit most all of the attractions are just steps from your door. There are many different accommodations to choose from. You can stay any time of year and enjoy every moment of your visit. There are motels to stay at, bed and breakfasts and charming inns. You can even stay at the marina if you come by boat. 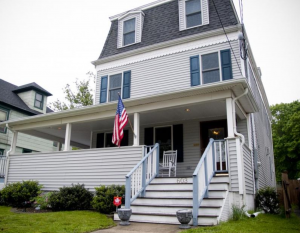 Your options range from modern hotels to historic, Victorian-era homes. Two of the most popular places to stay are the Saltwater Inn and the Tandem Bike Inn. At the Saltwater Inn, you get accommodations close to the beach. It is a charming place and the owners maintain the Inn quite well. It has been recently updated and each guest will be given their own linens. Breakfasts are delicious and visitors claim the owners are highly accommodating. The Tandem Bike Inn is another charming inn that is located near 10th Avenue and E Corner. This is the ideal location for any Bruce Springsteen fans to stay at. The moment you enter the door you will notice it is well decorated and comfortable. Breakfasts are served daily and the owners serve unique and deliciously prepared recipes. Muffins and fresh fruit are available before the entrée arrives. Coffee is available all day and night. You can rent bikes, of course, and enjoy even more of your stay by touring the town on a set of wheels. The owners are only too happy to ensure that all of your needs are met. Each room is decorated with beauty and charm. Some come with large soaking bathtubs and showers. This is a quiet place to stay and makes the best place to come to after a busy day of soaking up the sun or surfing or kayaking. The Tandem Bike in is in the perfect spot because you can walk a few blocks and go to your choice of dozens of restaurants. The marina is easy to walk to as is the beach which is about five blocks away. You do not need to rent a car when you stay here because everything is within walking distance. 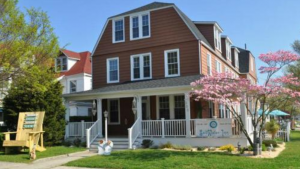 The accommodations in Belmar are almost as charming as the town itself. There are many different rates offered so there is something for every budget. You can get a peaceful, relaxing beachside vacation any time of year. More information about the best accommodations can be found online at Belmar’s official website and from travel websites, too.